Early on in the first full year we were open, there was this older well-dressed gentleman who came into Bang Bang Burgers for the first time. We weren’t really busy so I took some time to talk to him and explain the menu and I helped him order. He said he was a real foodie and I took that as a challenge. I went to the kitchen to cook him some perfectly cooked juicy medium burgers, a simple double Bang Bang Burger with fries. Proud of my perfectly cooked burgers, I brought out the order myself and sat with the gentleman for a bit as he ate. We made small talk and I was waiting for him to shower me with praise about how wonderful his burger was but praise was not on the menu that day. He showed me how the burger that I had so lovingly prepared was more toward medium well and not medium and that the bun was soggy. I looked on is disbelief, but I grudgingly agreed that the burger was grey in the center and not pink and his bun was definitely soggy. I obsessed about this failure for days. How is it possible with my years of experience, I had so thoroughly failed to produce a medium burger? As I ran that whole experience over and over again in my mind, I recalled that the gentleman and asked for extra onions and I brought some to him on the side. We don’t have a slicer in our tiny kitchen so everything that is cut is done by hand and that batch of sliced red onions just happened to be cut a little thicker that day. I recalled that he placed these two thick slices of red onion on top of his burger as we chit chatted about nothing, he put the top bun over his burger and proceeded to push down on his burger to get it to a reasonable thickness so that he could get it in his mouth. Bam! That was it! I finally figured out what had happened. 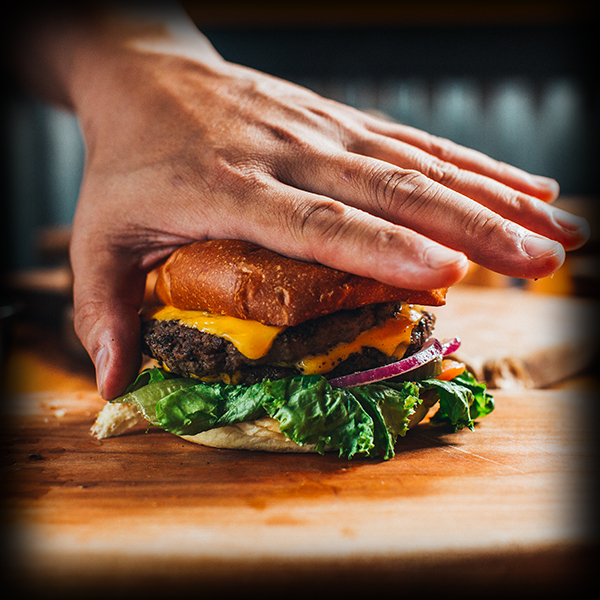 He ruined my perfectly cooked burgers by pushing down on his sandwich thereby pushing all the juiciness out of the burger and that juicy goodness was readily soaked up by the bun. I immediately wondered how many quests didn’t complain, but inadvertently changed the temperature of their burger by pushing down on it before that ate it. Lesson learned. Just like I tell my grill cooks to never push down on the burger to make it cook “faster” keep in mind that when eating a juicy burger, you might just ruin it by pushing down on it before you bite into it. My solution? Open your mouth wider. What’s the Deal with Putting Ketchup Over the Entire Top Bun? 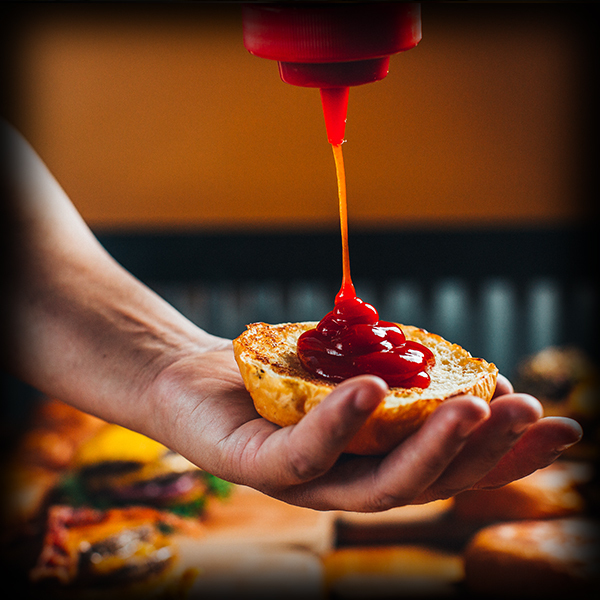 It would be an exaggeration to write, “nothing is MORE frustrating than…” but I think it is accurate to say that it is disappointing to see guests take our red 22oz squeeze bottles of ketchup and empty what looks to be 1/5th of the bottle over the top bun of their burger before taking their first bite. More than 50% of “first timers,” at Bang Bang Burgers do just that. Now don’t get me wrong. I’m not trying to be a food snob. I love ketchup. Who doesn’t have ketchup in some form or another in their kitchen? Partly to blame for that is that we tend to think that ketchup doesn’t really go bad so that we keep the ketchup we bought last year in the frig and still use it today, but that’s another story. The president of my culinary school, Ferdinand Metz was a certified master chef (CMC), had an MBA from Fordham University and reportedly at $750,000 annually was one of the highest paid school presidents in the country. He also had the great distinction of working for Heinz Ketchup Company to produce their secret formula for their crack level addicting balance of sweet, sour and salty flavors. So this may be where I start to venture dangerously close to that line labeled food snob, but keep in mind folks that I only have good intentions here. Look, I truly believe that the reason many people soak their burgers in ketchup before they’ve even tasted it is because up until that point, most of the burgers they’ve eaten haven’t tasted very good. Ok, so before I go further, I want to sink up our burger expectations just a bit. I demand, (and so should you) that when I take that first bite of my burger, I should experience the following. The flavors I should taste will include buttery, rich, juicy, beefy goodness with some salty, smoky charred flavors that come off an open fire char-broiler. If your burger is going to taste that good, does it really need a layer of ketchup over every single bite, which is the result you get when you put ketchup over the top bun of your burger. Now I’m not saying, don’t use ketchup. That sweet and sour combo you get from ketchup, once that hits your tongue pretty much instantly makes you salivate, and if you truly want to enjoy your food, it helps if your mouth waters. It has to do with breaking down food and then helping it to dissolve over your taste buds which enhances your ability to taste which is probably more analysis then we need on the subject, so I’ll just stop here. Which brings me to the point of this whole article in the first place. Yes, make ketchup a seasoning and part of the burger experience but use it sparingly. I would suggest squirting a small mound of the stuff in a ramekin or on your plate/cutting board, and dip the burger into it before you take a bite. Then I would alternate between ketchup, no ketchup, some other sauce etc. and so on a so forth. In other words, vary the flavors that go into your mouth so that you’re not just tasting the same thing over and over again. Eating burgers is pretty much universal and for someone to be arrogant enough to tell people how to eat their burger can come across as stuck up and snobbish, but I do this for a living folks, so in the spirit of adventure and trying something different, I hope you give my suggestion a try. Happy burger tasting and I look forward to speaking with you again in the next blog post. What’s Up With the Little Spoon? 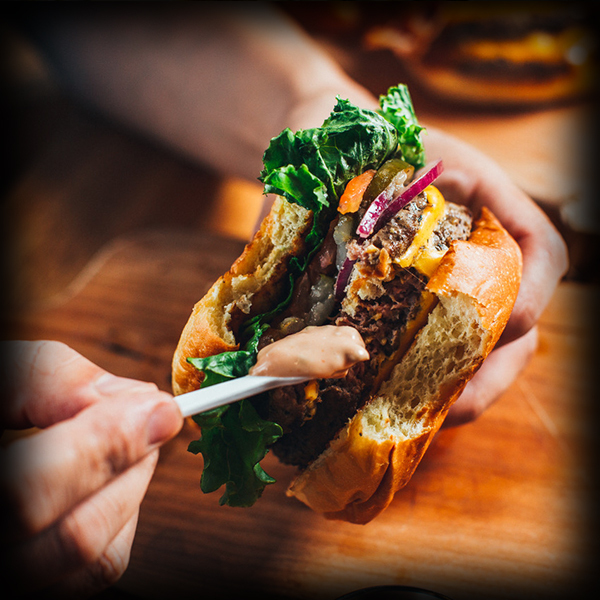 When I first opened up Bang Bang Burgers, figuring out how we would serve the burgers, sauces, fries and sides all had to be painstakingly considered. I needed to decide whether or not to serve lettuce and tomato with every burger and whether or not to serve the burgers with the sauces already on the burgers or on the side. Guests rarely think about these things, but as the restaurant owner, these details can sometimes make or break you. I can share that whenever I wasn’t sure about how I should do something when it came to food presentation or recipes, I would think back to how I would make the food for myself. 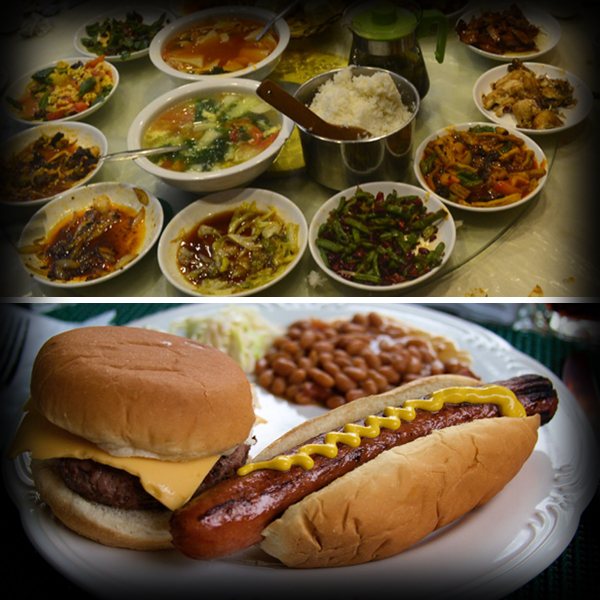 Growing up in an Taiwanese American family, eating pizza, spaghetti with meatballs, mac and cheese, hamburgers were all treats that I would savor. My grandmother would make me snacks when I came home from elementary school and she would prepare American style meals with dinner rolls, meat and potatoes and I loved it. What makes a great meal for me is variety in flavors, textures, and temperatures. Putting sauce all over everything you’re eating to make everything uniform in flavor takes away some of the enjoyment in my opinion. So, what does this have to do with the little spoon you will find in the ramekin when we serve the sauce on the side? My idea had always been to have guests put the sauce a bit at a time in the area where they were biting. So, the sequence might be one bite without sauce, another with sauce, another without and so on. I’d argue that the reason why people slather sauce over everything at one time is for convenience like if you were driving and eating for example. If you only have one hand to eat, putting sauce over everything might make sense. But if you’re sitting at a dinner table and are looking to really enjoy your meal as opposed to eating as quickly as possible, my suggestion for enjoying yourself is to put a little bit of sauce at a time. That’s what the little spoon is for.